Happy November! I hope everyone had a fun and safe Halloween weekend. I am actually really glad that Halloween is over, its always so stressful trying to figure out a costume… and now that I am too old to have my mother stitch me a homemade costume from scratch I am left to piece together random pieces of clothing to make one. 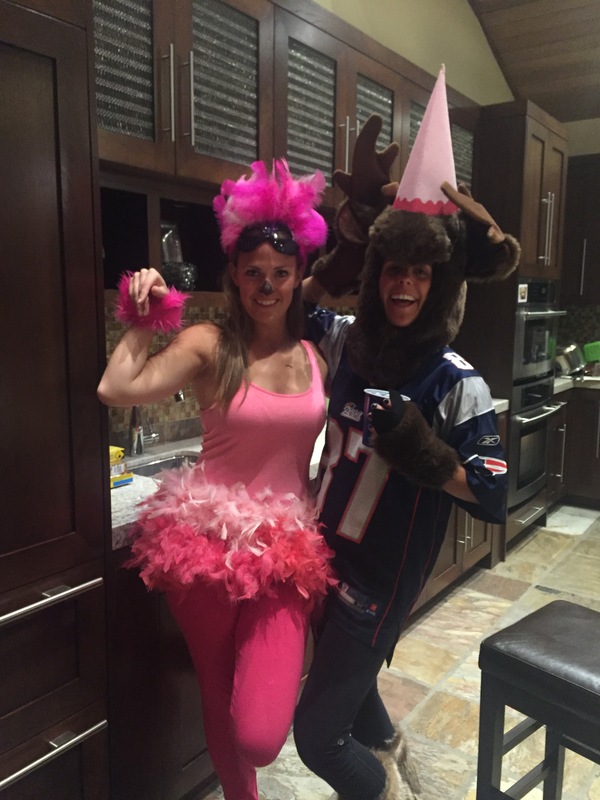 Exhibit A: this year I was a “Party Animal” (that is my friend Aly, she was a flamingo!) Bottom line is I am too busy (and lazy) to spend more than 30 minutes (and $15 dollars) on my costume. So now that Halloween is out of the way… we can start getting ready for the best holidays- Thanksgiving, Christmas, Hanukkah- You know… the eating holidays! With the weather getting colder and my Thanksgiving menu on my mind (and leftovers!) I thought chicken pot pie would make a cold November night a whole lot better! As you already know, I am a HUGE fan of rotisserie chicken, it makes my life so much easier. Life is already complicated enough, why should cooking be complicated too? This recipe works great with rotisserie chicken or leftover turkey, and my favorite way to eat it is with a little homemade cranberry sauce. Hope you enjoy! In a medium saucepan bring some water to boil, then add carrots, celery and peas. boil for about 5 minutes. Drain the vegetables and put in a bowl with the chopped chicken meat. In another saucepan melt the butter, add the onions and cook until they are soft and translucent. Stir in the flour until a thick paste forms. Slowly stir in chicken stock and milk or cream. Simmer over medium-low heat for about 10 minutes, stirring occasionally until the sauce thickens. remove from heat and season with salt and pepper. Bake in a preheated oven for 35-40 minutes or until the pie crust is golden brown. Cool before serving. I love to eat my chicken pot pie with a little fresh cranberry sauce! Makes it taste like Thanksgiving dinner! Enjoy! 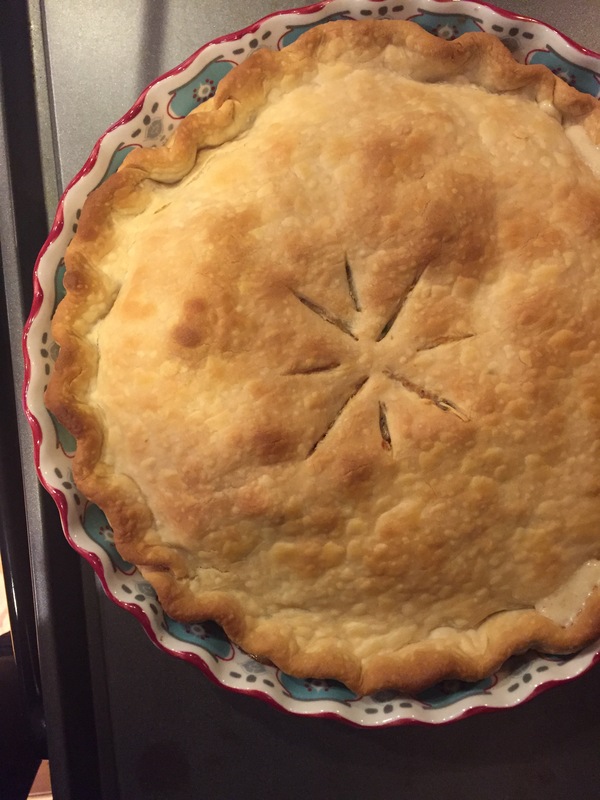 This entry was posted in Entrees, Holiday Dishes, Recipes and tagged Chicken Pot Pie, Rotisserie Chicken, Turkey Leftovers by skibootsinthekitchen. Bookmark the permalink. Look yummy! I love pot pies! !